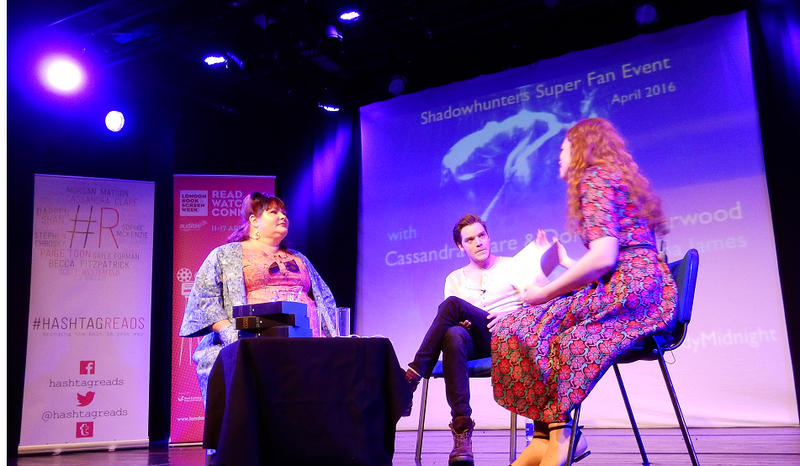 The previous Saturday kicked off Cassandra Clare’s UK and Ireland tour for Lady Midnight and fans who attended the London Super Fan Event were also able to meet Dominic Sherwood from Freeform’s Shadowhunters. I flew over to London to see Cassie and Dom, to get my books signed and to meet lots of other fans. Before the event I was allowed to meet Dom backstage and later had the amazing opportunity to once again interview Cassie. Cassie has a "bible" and a wall covered with information about her world. Cassie loves noir mysteries although writing one is difficult. It was still fun. The idea of parabatai are based on Greek warriors. There's a very intense love between parabatai. "The Clave has become subtly evil"
The Cold Peace is based on the Treaty of Versailles. No villain thinks that they are actually evil. They have "good" reasons for their actions. Since LA isn't that old, coming up with Shadowhunter history there was a bit difficult. Having lived there helped a lot. @TMI_Source Cassie knows a few fan theories. Cassie just mentioned her Valentine/Isabelle theory. Go to 13:10 to hear Cassie’s explanation and her thoughts on this theory. Seeing her world on screen is very strange. It's like an alternate universe fanfiction of her books. Dom: "@arosende is a huge fan". Dom wants to read on, but he'd be confused because the TV show is different. Dom loves the fans and their enthusiasm for the books and the TV show. Cassie loved the Falcon story on Shadowhunters. "Dom did a really good job." Some actors wanted background information and others didn't. Alberto is the expert so he didn't need extra info. Dom: "I know I'm in it!!" There's a direct pickup. We'll see Jace and Valentine on the ship and there'll be a lot.of Clace and Malec. We'll also meet the Seelie Queen in season 2 and apparently in Lord of Shadows. Emma and Co will spend time in modern London and Faerie. Dom: "Izzy is the best cosplay." Cassie: "Ragnor is great because of the horns and the green colour." @cassieclare has no favourite ship, she's fond of all of them. The Q & A is over now and it's time for the signing now. After getting my books signed and stamped by Cassie, I took a picture with Dom and got my plastic mango signed. He was really sweet and super nice to the fans. He signed books, gave lots of hugs, took pictures with fans and stayed much longer than intended. Got my mango signed by @DomSherwood1. While Cassie was busy signing books I had a quick chat with her husband Josh, the co-author of The Shadowhunter’s Codex. He’d really like there to be a second edition of the Codex with new material like detailed maps, information on Sebastian’s Dark War and more. Fingers crossed this will happen! Thank you so much to Cassie, Dom and Josh for a memorable day, thank you, Simon & Schuster UK as well as Waterstones and thank you to Georgia Lawe for working with TMI Source over the last couple of months.